Availability: Camille Rose Naturals Holiday Collection products are only available online at CamilleRoseNaturals.com. I'd love to see these specialized items at Target, and maybe seasonal releases will be a new thing for the brand (hopefully). I love when brands get bold and switch it up a little bit. Affordability: I purchased both the leave-in and hair bath at CamilleRoseNaturals.com during their Black Friday/Cyber Monday sale for 25% off. The products individually retail for $13 and $16, respectively. 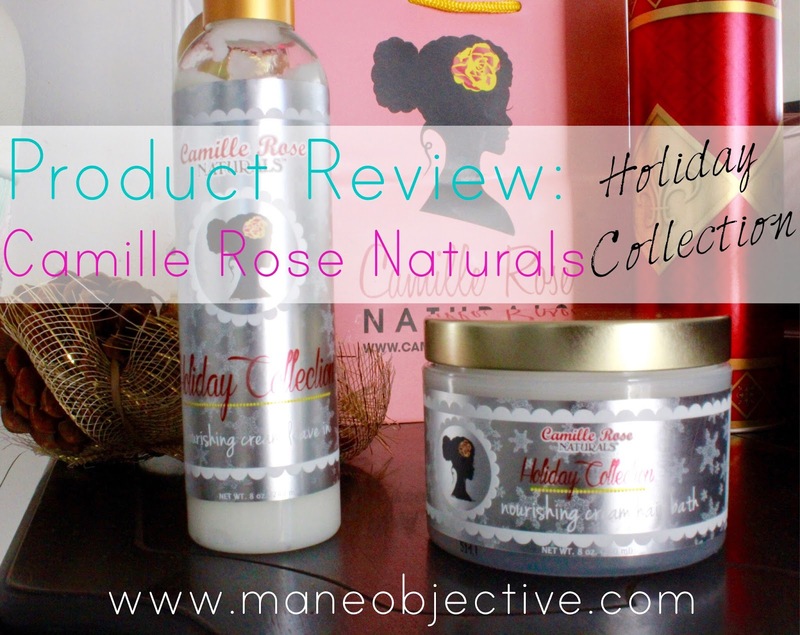 Although a bit on the pricier side (Camille Rose products in general are not cheap...or cheaply made), I did find it interesting that these Holiday Collection products were on the whole less expensive than the Camille Rose Naturals mainstays. Leave-ins and lotions in general from the brand are $14 and up, while deep conditioners are around $20. Offering these limited editions for less is a good look, in my opinion. Before shipping, purchasing them both on sale only hit me for $21.75 before $5 shipping. I'd label that pretty affordable -- a little under $11 for each product on average. Both products are 8oz. Now for the individualized stuff. Ingredient List:Water, Cetearyl Alcohol, Cetyl Alcohol, Behentrimonium Methosulfate (BTMS), Coconut Fruit Extract, Marshmallow Root Extract, Hemp Seed Oil, Shea Butter, Grape Seed Oil, Green Tea Extract, Flaxseed Oil, Sunflower Seed Oil, Phenoxyethanol, Caprylyl Glycol, Fragrance, and LOVE! Cetearyl and Cetyl Alcohols: Considered "fatty alcohols" -- NOT to be confused with drying alcohols such as ethyl. Act as lubricants, thickenesr, and emollients. Give conditioner its velvety feel without making hair greasy. Also used to keep product ingredients from separating. Behetrmonium Methosulfate (BTMS): Gentle surfactant made from non-GMO rapeseed (canola oil), and is one of the mildest detangling ingredients out there. It doesn't cause buildup or irritation to the scalp. Coconut Fruit Extract: Extract of the meat of the coconut. Not the same as coconut oil -- although it contains nutrients nourishing to hair. Marshmallow Root: Extraction that creates a slippery, mucous-like substance that adds incredible slip (translation: awesome detangling), and contains high amounts of plant proteins for strengthening and conditioning hair. Hemp Seed Oi: Ceramide-rich oil essential to the cohesion of the cuticle and maintenance of its protective effect for the hair shaft. Hemp oil and other ceramides are known to protect and/or repair the hair fibers. In particular, they have a barrier effect which limits the loss of proteins. Also reinforces cuticle cohesion, which gives the hair more strength and liveliness. Product Claim/Description: This hydrating hair tonic has a triple infusion of tropical cocoa cream, grape, flax, and hemp seed oils. This one of a kind formula is light enough for finer hair types, but powerful enough for thicker textures. Performance/Delivery: Let's get this out of the way first: fragrance = delicious. I thought the two products would smell the same, but they have a subtle, yet distinct fragrance from each other. The Leave-In has undertones of that vanilla-eqsue fragrance we have come to expect from Camille Rose Naturals, but warmer. It's almost caramelly. There's a hint of Christmas spice, but the sweet, vanilla caramel aroma takes center stage. It reminds me of my Archer's Farm Vanilla Creme Brule K-Cups, and I almost tasted some of the Leave-In (please don't judge me -- it smells that good). Consistency-wise, it is incredibly creamy without being greasy. It's thicker than Fresh Curl, but a million times thinner than Curl Love Moisture Milk. Once the Leave-In made it's way onto my hair, i was instantly in love. It is incredibly moisturizing, but at the same time it didn't weigh my hair down. My hair feels so soft and silky. It's nothing short of amazing. I've been waiting for something like this from Camille Rose Naturals for a loooooong time. Something for us ladies with curly hair that isn't baby smooth. Something that moisturizes but isn't too watery, and isn't too saddled down with heavy butters. Nothing but Leave-In on my hair! Yasssss! For me, Camille Rose Naturals hit this one out the park! It smells great, I love the consistency, and it has great slip. The Leave-In glided right through my hair with no drama whatsoever. It plays nicely with other products, and most importantly, Curl Maker. It's a tragedy to me when an entire line of products can't work cohesively. Nice to know that I can pair this with one of my Holy Grails with no drama! I honestly didn't expect the Nourishing Cream Leave-In to work as well as it did -- nor did I expect it to be my favorite of the two products. I thought I'd love the Hair Bath more, but nope! The Leave-In is the undisputed champ in my book. You should see me right now, sniffing my hair as I write...smh. The fragrance lingers in the hair, but not in an overbearing, allergy-triggering way. If you had problems before with people wanting to touch your hair, you're going to have even more problems after using the Leave-In. Not only will they want to touch, they'll want to sniff. Don't say I didn't warn you. Drawbacks: The only drawback I see here is the fact that it's limited edition. I hope Janell and the Camille Rose Naturals team decided to release a year-round leave-in conditioner in the very near future! Bonuses: It doubles as a moisturizing hair lotion. You can apply it to dry hair for extra moisture, to refresh curls, and hydrate strands. I've been using it on the ends of my hair before applying my JBCO, to help prevent splits, SSKs, and breakage. It's also Curly Girl friendly, and will probably work for the ladies on the Max Hydration Method. It's silicone, protein, formaldehyde, and cruelty free. I also love the fact that it contains hemp seed and flax, two oils really rich in omegas and ceramides. Replenishing the lipid barrier is super essential for ladies with dry, damaged, or color treated hair (like me). Please make this available throughout the year. Please, pretty please. I don't know how I'll function if I have to wait until next November/December to get my hands on this. Okay, maybe I'm being a little drastic. But I will definitely be sad. Best Practices:To get that slippy dippy goodness, use on wet hair. Hair doesn't have to be dripping wet, but wet enough to assist the Leave-In in gliding through the strands. Other than that, treat it like you would any other leave-in or creamy product that you use underneath stylers and gels! Overall Product Rating: 5 stars, hands down without a doubt. A product that smells great, has an impeccable ingredient list, is reasonably priced, and does exactly what it says it will do. How often does stuff like that come along? Ingredient List: Water, Aloe Vera Juice, Cetearyl Alcohol, Shea Butter, Behentrimonium Methosulfate, Horsetail Leaf Extract, Nettle Leaf Extract, Peppermint Oil, Rose Hip Oil, Jojoba Oil, Grapeseed Oil, Cocoa Butter, Phenoyethanol, Caprylyl Glycol, Citric Acid, Fragrance, and Love! Cetearyl Alcohol: Considered "fatty alcohols" -- NOT to be confused with drying alcohols such as ethyl. Act as lubricants, thickeners, and emollients. Give conditioner its velvety feel without making hair greasy. Also used to keep product ingredients from separating. Behentrimonium Methosulfate (BTMS): Gentle surfactant made from non-GMO rapeseed (canola oil), and is one of the mildest detangling ingredients out there. It doesn't cause buildup or irritation to the scalp. Horsetail Leaf Extract: Herbal extract known to have high silica contents which are beneficial for strengthening and growth of hair. Product Claim/Description: Curl recovery hair mask sweetened with ginger root and butter cream aromas! Golden certified organic jojoba and rose hip oils with our cocoa butter base conditions and heals damage hair naturally. Nice and thick...but not too thick. Performance/Delivery: Much like the Leave-In, the Hair Bath smells ah-MAY-zing. Like, whoever handles Camille Rose Naturals fragrances needs a serious Holiday bonus check. The Hair Bath smells like everything that's right about the month of December. It's a seasonally appropriate warm vanilla spice that conjures of dreams of warm family gatherings, hot apple cider, snowy days, and Christmas cheer. Or for those of us that live in LA and don't get those snowed-in days, it smells a million times better than the best holiday Bath and Body Works candle you can find. Seriously. In truth, it smells similarly to TreLuxe's Untie the Knot Leave-In, but sweeter. Untie the Knot has a spicier aroma than Hair Bath. As far as consistency is concerned, it's thick, but not too thick. It reminds me in look and feel, a lot of Curlaide Moisture Butter. Even though it is a thick whip, it takes to the hair really easily. The slip is phenomenal. As I applied it in the shower, all it took was a few handfuls of water to help me completely finger detangle with the Hair Bath in my hair. It felt super rich and smooth in my hair, and I was incredibly hopeful that hair bath would be everything my hair needs -- especially in the moisture department. I sat under my hooded dryer for about 25 minutes with Hair Bath in, utilizing the heat to help the ingredients penetrate and adhere to my hair. I rinsed in lukewarm/cool water, per the instructions. My hair felt soft, and incredibly moisturized once the mask was completely out of my hair. But the one thing I was missing? That buttery smoothness. My hair was smooth, but not that velvet-like smoothness I have come to expect from my top-performing deep conditioners. Maybe I need to adjust my expectations, because I know that velveteen feel typically comes from deep conditioners with cones (like Therapy Session Hair Mask). The end result reminded me a lot of my experience with Eden BodyWorks Coconut Shea Hair Mask. My hair felt ultra-moisturized and like it took up all of the good ingredients, but it wasn't super buttery smooth as I expected. All in all it was a good deep conditioner, and I have absolutely no qualms about finishing out the rest of the jar. And by the way, do you see that shine??? Drawbacks: Aside from the velvety smoothness I didn't get I've got nothin'! Bonuses: Looking over the ingredients, I'm pretty sure that this Hair Bath can double as a hair butter or moisturizer. It has all the makings for an ultra-nourishing, hydrating, and softening hair whip. If you frequently use deep conditioners as styling aids, give it a whirl and report back :) Another bonus is the slip! Any deep conditioner that helps detangle is a winner in my book! Bottom Line: A solid deep conditioner, but it doesn't de-throne Algae Renew Deep Conditioner from Camille Rose Naturals. If you suffer from super-parched hair and like holiday fragrances, this is for you! Just go in with the expectation that you may not get that velvety feeling hair. But it will be shiny, soft, and defrizzed. Best Practices: Apply the Hair Bath to soaking wet hair for best results, as far as slip and detangling are concerned. Use heat to help the ingredients absorb and adsorb to the hair! Overall Product Rating: 4 stars. It works well, and has great ingredients! Will you be trying the Holiday Collection from Camille Rose Naturals? I need to order more Nourshing Cream Leave-In, but the way my financial goals are set up..... lol. Great review. i am new to a lot of the natural hair products so i haven't tried this brand but will definitely look into it. Great review! Your hair is gorgeous. That Curl Love Moisture Milk is THE TRUTH!!! !